Did you know gelato made from cashew nuts existed? Until recently I didn’t either. 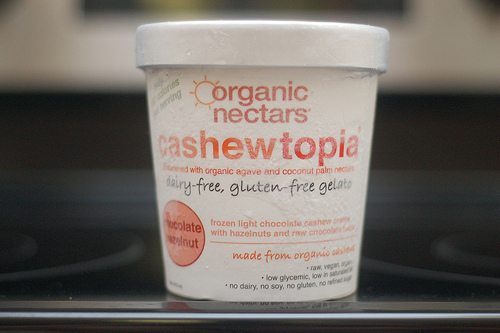 In fact, if it weren’t for me going out of my way to find unique desserts in order to have material for my reviews, I probably would have never tried Organic Nectar’s Cashewtopia Chocolate Hazelnut gelato. One of the reasons I had not been interested in this product is the packaging, magenta and black text against a plain white background, didn’t really appeal to me. This design could be said to succeed in the sense of differentiating the product line from competitors, but it feels too sterile to me, almost like a medicine bottle design. My other issue with the package design is that there is just too much text. There is over 10 lines of text no the front, and the back is even worse, with a very long description of how healthy this product is for you. Reading this, we learn that this gelato is sweetened with coconut and agave syrups, made in-house by the same company which are also sold as separate products. It makes me happy to know they are using two natural sources of sweetness, and the fact the sweeteners are self-produced means they probably have greater control over their quality. But it also annoys me since they are not-so-subtly advertising their own products in both the long descriptive text and the ingredients list below. The thing that got me thinking about the design of this product was the “org” abbreviation for “organic”, used several times on the label. As it was the first time I had seen this particular shortening, it took a few seconds to register, especially because the full word “Organic” is used elsewhere in the ingredient list (it so happens this is only for their self-made syrup and nectar). After thinking about it for some time I finally realized that the only reason they abbreviated to “org” is because they ran out of space with such a cluttered and over-verbose design. I was able to get the needed information from the package, but I just wish they had conveyed it in a more elegant and minimalistic way. To be honest, the flavor is very… lets just say different that what I was expecting. The hazelnuts scattered throughout are small and irregularly shaped, but they have a nice crunchy texture in the mouth. The problems is with the base itself, which has a strong sweetness that tastes somehow odd to me, and tastes quite unlike cashews. I’ve had a dessert which contained a high proportion of agave (Luna & Larry’s Coconut Bliss, Chocolate Hazelnut fudge), but in that product the sweetness was toned down. Here, its more in-your-face, and just tastes different. I’m not sure how to explain it – a effect caused by cashews, some difference in the plant or processing of the agave, or possibly some other minor ingredient. It’s not that I hate the taste, just that its strange and hard to get accustomed to. Even the scent is very unusual and has some overtones not present in coconut, agave, or cashews. Having said that, I’ve been able to eat over half a pint so far, and will likely finish it up in the next few days. The only question is will I buy this again, hoping to get used to it for the sake of the nutritional benefits, or stay with frozen desserts which are more my taste. The marketing quip on the label is correct in that this gelato has (slightly) below-average calories, with 160 calories in a 85 gram serving. My mini database of ice cream figures has about 170 calories as an average figure for this serving size. Sugars is 16 grams which is also a bit below average, though the sugar is from two natural sources (coconuts and agave) so it may be healthier than some frozen desserts which use only table sugar. Protein is suspiciously low at 2 grams per serving. Cashews apparently have 5 grams of protein per 28 grams worth of total weight, and from that you can infer there is a relatively small amount of cashews in this product (my calculations estimate 8-10%). Just because they are listed first doesn’t mean there is necessarily a huge amount of it present. Nutritionally this product is great, with a wide array of natural sources, some of which are thought to have many beneficial health effects, such as coconut and cashews. There is no added sugars, no artificial flavors, and no artificial colors. For those trying to avoid certain foods, everything is dairy-free, egg-free, soy-free, gluten-free, vegan, and certified organic and kosher. As with other companies, they won’t tell you what’s in their ‘secret sauce’, but its nice they have limited the possible components and the proportion used in the product. Honestly I don’t understand how anything present in such a small dose (0.025%) could have any effect on the taste, but I clearly have more research to do in this area so I can learn how these “natural flavors” are made and influence the overall taste. Full ingredient list: raw org cashews, purified water, Organic Nectars AgaveLight (raw organic agave syrup), org hazelnuts, org gum acacia (nutritional acacia sap fiber), org agave inulin (nutritional prebiotic fiber), org raw cacao powder, Organic Nectars PalmSweet (organic evaporated coconut palm nectar), org virgin coconut oil, org safflower oil, org raw cacao butter, org guar gum (nutritional jaguar plant seed fiber), org arrowroot, pink crystal salt, org chocolate hazelnut flavor. I bought this at Whole Foods for around $7.49, quite expensive for a pint. I understand premium/specialty products have justification to keep their prices high, but in the long run I feel this product only has a chance to succeed if they lower prices to a more reasonable level. This gelato is a Jekyll/Hyde to me – amazing nutritional potential but the weird sweetness that dominates the flavor is hard to ignore. I recommend waiting until the price drops to $5-$6 and then try it yourself, or one of the company’s other flavors. 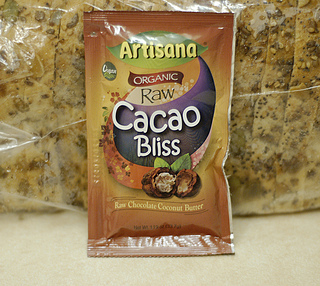 Artisana Organic Raw Cacao Bliss – The coconut lovers’ spread! A majority of the products I’ve reviewed in this blog up until now have been longtime favorites of mine, something I’ve enjoyed for months if not years. Those reports were a lot of fun to write, but I’m running out of ammo. If I am going to keep updating this blog at the same rate, I’m going to have to adventure out and try new things. It will be a great experience for me to see what else is out there in the world of sweets, and I hope some of you readers can learn about some products you hadn’t heard of it, or hadn’t had a chance to try. My last review was partially in this category, but the subject this time, Artisana Oganic Raw Cacao Bliss, was chosen just so I could have something interesting to report on. I wasn’t able to find out the official date this product was released, but I just noticed it on the shelves of Whole Foods Market a few weeks back, so it may be somewhat new. I could just state the flavor is a mix of coconut and cacao, which would be quite correct, but that much you could easily guess just from the product name. In all fairness, I come a background of heavy “Justin” (Justin’s Chocolate Hazelnut Butter) use, so I can’t help but compare initially. Texture wise, cacao bliss is much more oilier with a finer consistency, almost what I would describe as grainy. Due to the lack of nuts this product is less ‘meaty’ than nut-based spreads. What really hit me in the face, so to speak, was how *coconutty* this spread is. I’m a big proponent of coconut-based ice cream, but I’ve never been overpowered by the coconut flavor there; it’s always secondary to the other flavors. In this product it’s really exposed, with the cocoa flavor taking a back seat. My first reaction wasn’t too rosy, but after I finished my slice of bread and rested a moment, I realized I wanted some more. So I worked my fingers and squeezed every last drop of this coconut-heavy spread into my mouth, and to my surprise was already liking it more. I have the feeling I’ll learn to love it as I eat more of this product, and learn to stop comparing it to other spreads. In one 33.7 gram pack there are 177 calories, a value on par with similar spreads. Sugar is very low at 3 grams, nearly half that of my beloved “Justin”. There all only five ingredients, all Organic: Coconut Butter, Extra Virgin Coconut Oil, Agave Syrup, Cacao, and Cacao Butter. Many will be happy to hear this product is both vegan and free of sugar cane sugar, and it should satisfy even the pickiest health fanatics. I’d like to note that the term “raw” is a bit vague, and most if not all of the ingredients here have at least some processing. Although the protein content (2 grams) is a little lower than nut-based spreads, both coconut butter and coconut oil are known for a wide array of health benefits. For example, they can increase metabolism, reduce cholesterol, and help maintain proper weight. Unfortunately in the world of nutrition there is always another side to things. Coconut oil is a saturated fat and hence should be limited a small portion of total calories due to potential increase in heart disease risk. So as with most things, eat this in moderation. This product is sold in 1.19 ounce (33.7 gram) packs, either individually or in sets of 10. I bought a single pack from Whole Foods for around $2.00, though if you look around you can buy a pack of 10 for as little as 1.67 per pack online (see references). It’s also sold in 6 packs of 227 gram jars, for roughly 20% cheaper than buying the 33 gram packs. Healthy chocolate spread which is great for coconut lovers.